Our last event of 2011 is on New Years Eve at Bromley Town Centre Market, where we'll be running our final stall of the year. Happy New Year to you, and best wishes for 2012! We are very busy with our Christmas Market in Bromley, ending Christmas Eve. A huge thank you to all our Twitter followers, Facebook likers, blog readers, website customers and of course our customers in the 'real world' for making this our most successful year yet. We wish you a very peaceful and relaxing Christmas. Visit us tomorrow and Saturday at Bromley Christmas market in the High Street, for more details click here. We have a really fab selection of jewellery and fashion accessories 'fun, sometimes quirky, and just that little bit different'. Or visit our website for a great online shopping experience. We send within 1 business day by 1st class post. Orders of £18+ will receive a FREE glass crystal bracelet worth £5 plus FREE UK p&p. Whatever you do, we hope you enjoy your Christmas shopping and find what you're looking for. We start our Christmas stall in Bromley high street tomorrow. The Christmas Market runs until Christmas Eve, and we have 5 bookings. Please click here for further details. Spitalfields vintage fashion fair tomorrow! Our highlight of the year, we're at Stall 113, be there or be square! Here are two fab vintage brooches that are ex-stock from the Grosvenor House Hotel, Mayfair, both priced at £27.95. Would make really lovely Christmas presents! I've been a bit busy this week creating a new line of vintage inspired pendants (up on the website soon!) and generally preparing in advance of the most busy period in fashion retail, Christmas! Please take a look at our website for the latest offerings. Not alot of money around at the moment, but we have some truly special items at a reasonable price for the discerning customer! This Sunday we're at the Langley Park Boys School in Beckenham with our fab jewellery and fashion accessories. The Christmas and Craft Fair is the schools largest fund raising event of the year with many beautiful stalls selling handmade, fair trade, vintage and new products. Why not give your Christmas shopping a brilliant kick-start? Hi Readers, we tried out Old Spitalfields Market on Tuesday, and came away a bit disillusioned. Yet again the popularity of costume jewellery made in China overwhelms everything else. I have even started to stock some myself. I'm not a purist about selling specifically vintage jewellery, although the real stuff is by far my favourite and incomparable. I doubt whether Chinese costume jewellery made now will survive 30 years or more. I never see any jewellery 'Made in Hong Kong' that was manufactured in the 50s, 60s and 70s. At the end of the day it's 'what peeps want'. I stock a few medium to high quality pieces made in China, and I have to say they really are attractive, and I'm sure I'll be down to the Chinese wholesaler for Christmas stock as it's just so popular. Costume jewellery made in China is affordable, the better jewellery is well made, and can be rather beautiful too. In these tough economic times it really is 'what peeps want'. I'd love to think that we could manufacture this kind of jewellery here in Britain, but of course it doesn't make economic sense, we don't have human rights issues, but that's another story. What do you think about costume jewellery made in China? The 1980's are currently the most recent 'vintage' decade, vintage being defined as 20-75 years old. 1980's vintage costume jewellery is easy to find and quite luxurious. The pieces of the time were bold and fake gold! Necklaces tended to be fairly short, around 46cm, and many earrings were still clip-ons. Christian Dior produced beautiful quality gold-plated items, some with imitation pearls and swarovski crystals. It was the beginning of bling. Perhaps the British trailblazer of them all were Butler & Wilson. Always well made, incorporating fantastic designs and high quality materials such as rhinestones and pearls, Butler & Wilson costume jewellery has always been sought after, and were at their height in the 1980's. I have a pair of Butler & Wilson earrings and they are absolutely gorgeous. Look for the B&W mark for authenticity. What I really love about vintage costume jewellery is that it is so well-made, available and affordable. There are always such exciting pieces to be discovered at local antique/vintage markets! Most vintage costume jewellery is unsigned, but with experience it is fairly easy to identify a piece. If the jewellery is signed, it makes research alot easier. There are many sources of information, but I find the Illusion Jewels website most useful. It is an American site absolutely packed with facts about researching costume jewellery, including an indispensable A to Z of jewellery marks and signatures, http://www.illusionjewels.com/costumejewelrymarks.html. A couple of tips. Pat pending dates a piece to pre-1955. In 1955 the American copyright law was amended to allow jewellery to be copyrighted, and jewellery companies began to use the copyright symbol (a c in a circle). For an excellent solid background read the gorgeous book 'Costume Jewellery' by Judith Miller, which features many vintage collectable pieces. By the way vintage is defined as 20-75 years old. Anything older is antique, and younger 10-20 years old is retro. Fun, glamour and style... the fascinating world of costume jewellery. Not for your average shopper, but stunning creations! Announcing our first ever Arabella Bianco offer! A FREE glass crystal bracelet worth £5 with website orders of £18+ (offer ends 31st December, one offer per customer). Enjoy FREE postage on all orders of £18+. Not bad! Don't forget this Sunday we're at the Essex Vintage Fashion Fair, be there or be square! Begin with a 5-lb potato bag in each hand, extend your arms straight out from your sides and hold them there as long as you can. Each day you'll find that you can hold this position for just a bit longer. We've just taken stock of the most exquisite pieces of vintage Carl Art jewellery. The Carl Art jewellery company began in Providence, Rhode Island in 1936, and was founded by German immigrant Carl Schraysshuen and American businessman Arthur Loercher. They manufactured fine quality gold, gold-filled, and sterling silver jewellery. After his death in 1953 Carl's half of the company was sold by his wife. Beautiful vintage inspired crystal statement ring measuring 2.1cm x 1.7cm. Set in silver tone metal, ring size between L and M.
A modern interpretation of a classic vintage ring for £7.50. Have a great weekend, and thank you for reading my blog. This is one of our stalls at Spitalfields market Vintage Fashion Fair on 29 August. This shows our tibetan jewellery, mostly made from yak bone. Very 70s retro! Our other stall, which you can just about see on the left displayed vintage and vintage inspired jewellery. We had a fabulous day, and met lots of wonderful people. Just returned from Paris. Truly Wonderful. Visited Claude Monet's house and garden in Giverny. I've not seen anything quite like the water lily pond. Very beautiful lilies in pinks, whites and yellows. I'm not really a fan of the Rolling Stones, though I do have a couple of their very well used vintage records. By all accounts though 'Life: Keith Richards' is a very good read. Buy through through my British amazon.co.uk store, or American amazon.com store. Have a great weekend and happy summer reading. We heard about the tragic death of Amy Winehouse at night on a coach in Sicily, which was quite surreal. Did you know that her inspiration was girl groups from the 60s? Hence the beehive hairdo. Such talent, but a victim of the modern world. Eliza wore these lovely leather sandals from New Look every day. Fabulous holiday in Sicily, we even saw Mount Etna erupting at night as we flew away from the island. Fred Astaire refused all offers to be portrayed on film. His will requested that no such portrayal ever take place; he said, "It is there because I have no particular desire to have my life misinterpreted, which it would be." Kate Moss got married last Friday. She looked very, very gorgeous in her John Galliano vintage inspired dress, and the bridesmaids could just have stepped out of Cicely Barker's 'Flower Fairies'. At 14 she was discovered by a modelling agency in JFK airport on her way back from a holiday in the Bahamas. When asking her schoolteacher's advice about modelling, she was advised to have a go and could always go into secretarial work if it didn't work out. Kate made the right decision. Something not everyone knows: Kate Moss is 37. A couple of beautiful summer scarves. High summer chiffon flower scarf and 1950s style spot and flower print scarf. 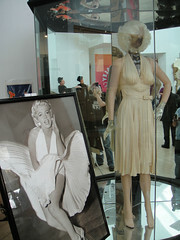 Fabulous new book to be released ''Dressing Marilyn'' by William Travilla. He designed Marilyn Monroe's most famous dresses including the iconic white cocktail dress from 'The Seven Year Itch' and the stunning pink dress in which she sang 'Diamonds are a Girl's Best Friend'. Order through my British amazon.co.uk store or American amazon.com store. I always thought this dress was quite plain, but now I see it has a lovely band and bow detail. Beautiful. Such a shame the Reynolds collection has been broken up. It would have been fabulous in a Hollywood museum. I always enjoy seeing these amazing creations in real life, I've gazed at Princess Diana's in Kensington Palace and Elvis's at Gracelands, what more can I say. Hi everyone, we've been busy putting lots of recently sourced items, vintage and vintage inspired, on our website. Here are just a few pics. If you wish to visit us in person we're at our market stall in Bromley High Street today. You'll find our unusual mix of jewellery & fashion accessories, something just that little bit different, we would love to see you there. Have a great weekend. Silver jewellery needs cleaning? This really is a fantastic tip and time saver. Toothpaste! To quickly clean silver jewellery rub with toothpaste and rinse. I tried this with a pair of earrings and was amazed at the result. Tell me what you think. Order through my British amazon.co.uk store (currently unavailable in the U.S.). We've just acquired two pairs of fine quality earrings: vintage Christian Dior gold plated earrings with irridescent pearls and crystals; and fabulous almost new Butler & Wilson faux opal and blue crystal earrings.